Today we celebrate St. Joseph, the caring guardian of Jesus and a faithful husband to his virgin wife, Mary. He was respectful of Mary’s virginity, even when he could not understand it. Joseph listened obediently to the angel when he was asked to take the Virgin of Nazareth as his wife. He obeyed again in the flight into Egypt and in the return to Israel. The Bible tells us little about Joseph. The Gospels of Mark and John and the Epistles never mention him. We hear about him in the first few chapters of Matthew and Luke. Then he fades out of sight. Silent and faithful, Joseph served the eternal Word of God, also called the carpenter’s son. Then, having done his duty, Joseph disappears without any fanfare, a man of humble holiness and everyday routine. My everyday routine, done in response to God’s initiative, may seem to have nothing to do with my story of salvation until I realize that I also am called to respond to something holy, God’s grace within me. 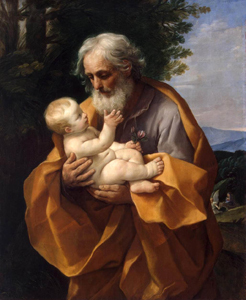 St. Joseph, Patron of the Church, pray for us.